She was so during our mother’s long illness. She is so now with our failing father. Patty’s drive is 1219 miles to the homeplace. 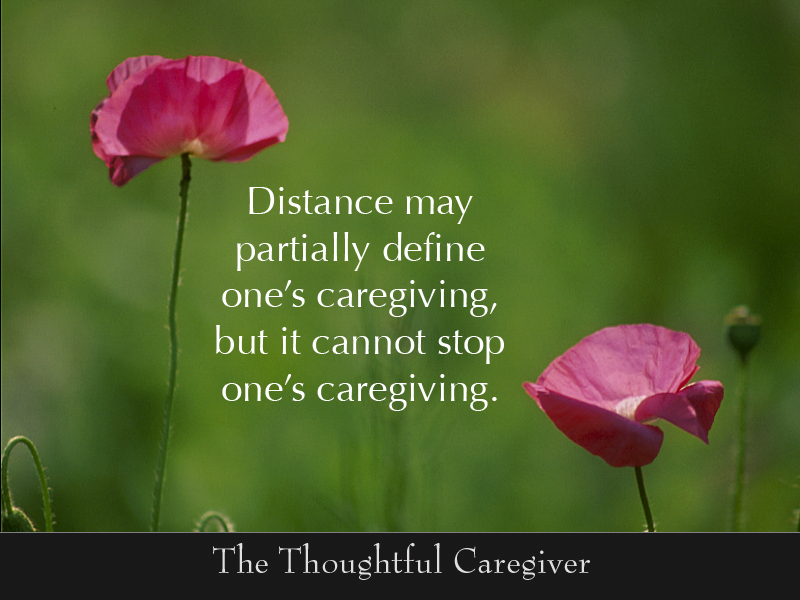 Undoubtedly, long distance caregiving has a unique character. Arms and hands cannot lift and pour and wash and comb. and if not personally managed, then at least lovingly overseen. that someone who is right next door might never consider. these times can have a special quality that’s remembered long after. whether or not the love keeps flowing back and forth. a carcinoma of the stomach. as she explored all possibilities for healing. that seemed to hold promise. but they are not nonexistent. we hold unshakably unto hope. Miracles are possible—we never doubt that. 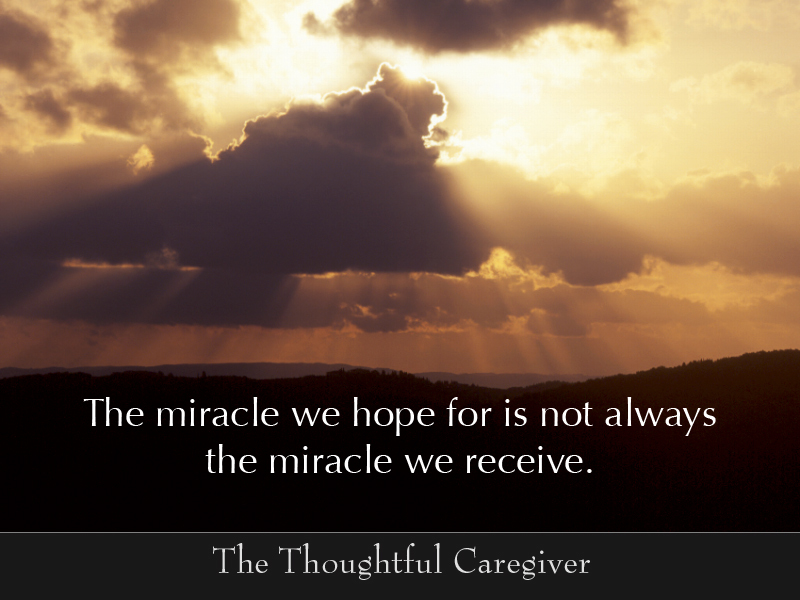 the miracle they sought did not come to be. that a miracle did not happen. their love was transformed by their experience. They became closer than they imagined possible. and with a new-found zest. even if it was not the one they hoped for. caregivers and care receivers alike. 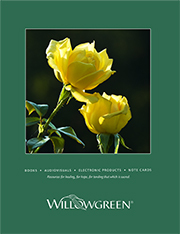 at a hospice in Minnesota. have left her with stroke-like symptoms. He cannot leave her by herself. it’s all his now to do. “I’ve learned that people do want to be helpful,” he told me. and Paul is appreciative of their kindness. But Paul enjoys cooking and he’s good at it. and converse with her while he is out of the house. “about asking for what I really need. their offers are sensitive and timely, exactly what we need. 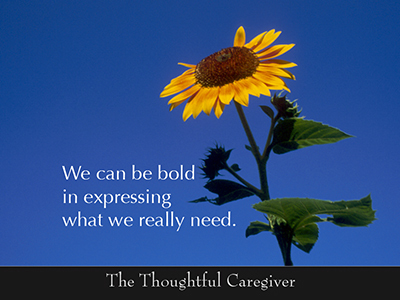 what life is like for us—the stresses, the difficulties, the handicaps. “Thank you for your kind offer. Right now, however, I have a greater need. knowing they’re doing what’s clearly helpful for us. giving us a bit of a lift. Over 60% work outside the home. gives 40 or more hours of care a week. rising to over 40% of the total. provide daily care for an adult relative. enjoying the out of doors. but for the one providing care. in any significant public way. even if we cannot see or know one another. that we are not all by ourselves. There are others like us, many others. that I never imagined I’d be providing as his son. where he lives in another town. 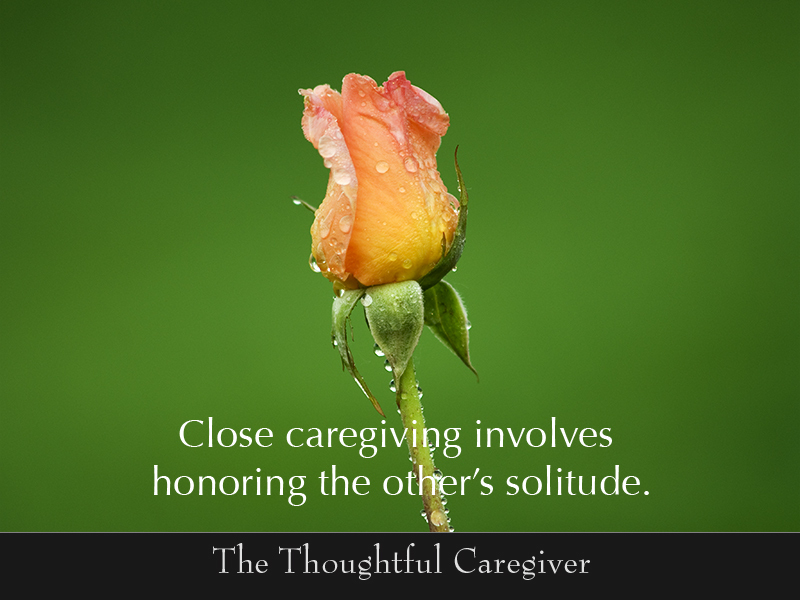 this constant care sometimes feels like an imposition, a burden. when my own needs were constant. his kindness, and his own brand of gentle, quiet love. Time after time in my life, he was there, solidly there. if someone had not shown us the way. or the parent on one of our friends. Maybe it was a neighbor, a teacher or a minister. 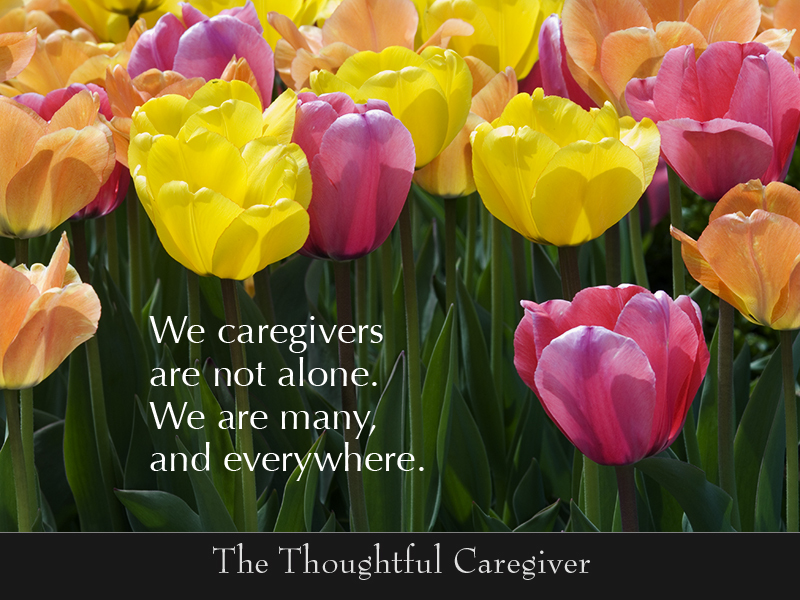 Maybe it was the very person who is being cared for right now. 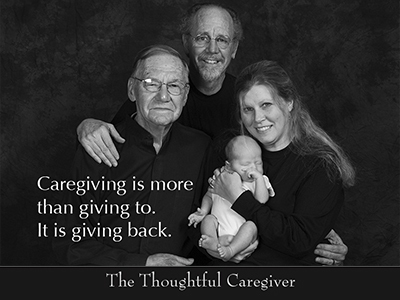 The caring we provide today does not originate with us. We have something to give because we have been given to. We are able to share because someone first shared with us. Then I would help her to the car and we would head quickly home. her nausea would begin within the hour. At the end of that trip across town lay what I disliked. for the better part of two or three days. She wanted to be left alone. She needed to be left alone. was the most loving action I could take. was one way I could offer my love. but a very important lesson. much as we wish we didn’t have to. to spend extended periods with her mom. She finds many occasions to send thoughtful gifts. For all she does, however, she feels guilty she’s not doing more. and my mother will not move here. 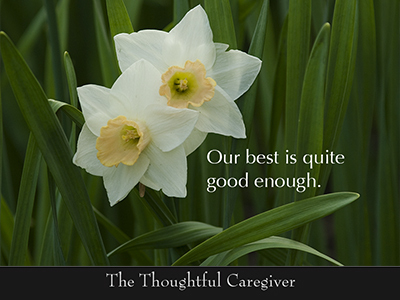 There is no objective way to measure “best” in caregiving. 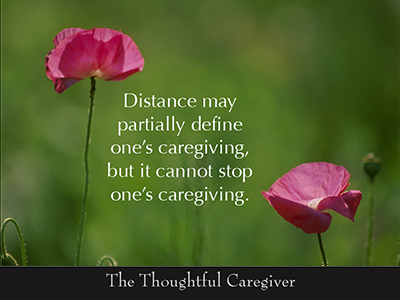 as what’s right for a long-distance caregiver. will be different from someone with fewer responsibilities. that often go unnoticed yet make such a difference. and then, as well as we can, do that. No one can handle everything. 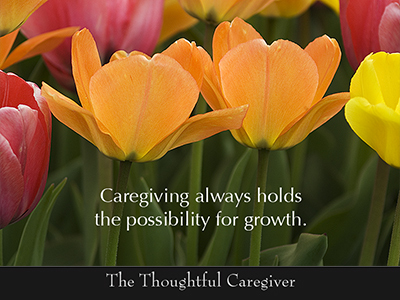 No one can do the various parts of caregiving equally well.